An amusement park for your parrot! 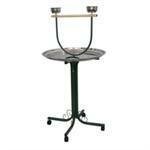 This play stand has so much to do, your bird will never get bored. 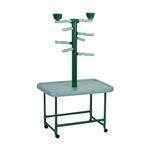 The A and E Cage Company Java Wood Bird Playstand is a design of nature and of skilled craftsmanship. 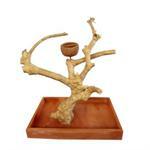 It allows your birds to feel like they are in their natural environment by standing on real wood! 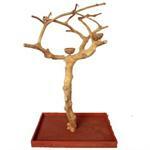 The Java Tree by A&E Cage Company is a natural tree perch made from a single coffee tree of 25 to 35 years of age when the tree becomes non-productive. 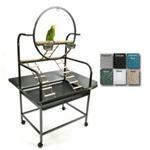 A & E Cage Company "O" Parrot Play Stand is the ultimate gym for your medium to large bird! The A and E Cage Company Caitec Parrot Playtower is a sturdy play tower that offers maximum outside-of-cage play space for your larger bird. 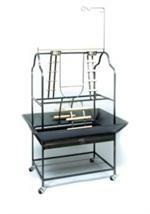 A & E Cage Company Ornate Style Bird Play Stand lets your bird out of the cage to join the family’s social atmosphere by providing them with this convenient play stand.